Sepsis is characterized by a complex immune response. This meta-analysis evaluated the clinical effectiveness of intravenous IgM-enriched immunoglobulin (IVIgGM) in patients with sepsis and septic shock. Four databases, PubMed, the Cochrane Library, the ISI Web of Knowledge, and Embase, were systematically searched from inception to June 2018 to update the 2013 edition of the Cochrane review by two investigators, who independently selected studies, extracted relevant data, and evaluated study quality. Data were subjected to a meta-analysis and trial sequential analysis (TSA) for the primary and secondary outcomes. Level of evidence was evaluated using the Grading of Recommendations Assessment, Development, and Evaluation (GRADE) scale. Nineteen studies comprising 1530 patients were included in this meta-analysis. Pooled analyses showed that the use of IVIgGM reduced the mortality risk of septic patients (relative risk 0.60; 95% confidence interval [CI] 0.52–0.69, I2 = 0%). 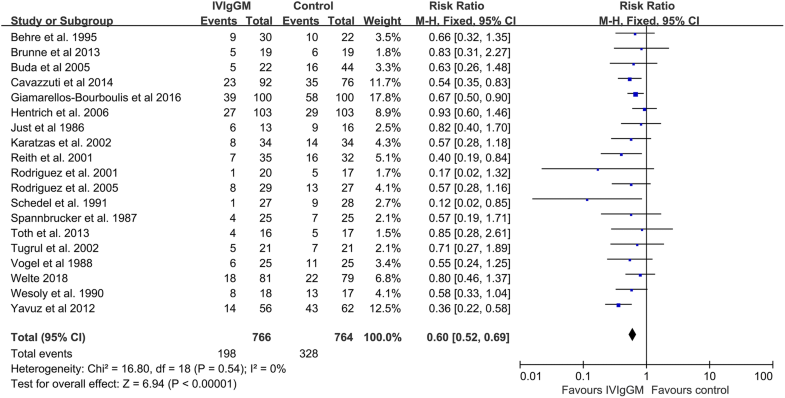 TSA showed that IVIgGM had a significant effect on mortality. Additionally, the meta-analysis suggested that use of IVIgGM shortened length of mechanical ventilation (mean difference − 3.16 days; 95% CI − 5.71 to − 0.61 days) and did not shorten length of stay in the intensive care unit (mean difference − 0.38 days; 95% CI − 3.55 to 2.80 days). The GRADE scale showed that the certainty of the body of evidence was low for both benefits and IVIgGM. Administration of IVIgGM to adult septic patients may be associated with reduced mortality. Treatment effects tended to be smaller or less consistent when including only those studies deemed adequate for each indicator. The available evidence is not clearly sufficient to support the widespread use of IVIgGM in the treatment of sepsis. Trial registration PROSPERO registration number: CRD42018084120. Registered on 11 February 2018. Sepsis and the related syndrome of multiple organ failure remain worldwide problems, with high mortality and morbidity rates . The standard surviving sepsis campaign (SSC) approach, including early eradication of septic foci, administration of anti-infective agents, and maintenance of hemodynamic stability through fluid administration and vasopressors, remains the cornerstone of treatment for sepsis and, in particular, septic shock . However, sepsis is a complex syndrome in that different types of microorganisms (e.g., bacteria, fungi) that vary in virulence (e.g., endotoxin production) and resistance to antibiotics may infect one or more body sites in patients with varying comorbidities. These patients, in turn, may vary widely in their responses to infection (e.g., hyper-inflammation, immune paralysis) and treatments. The recent Third International Consensus (Sepsis-3) defined sepsis as a life-threatening organ dysfunction caused by a dysregulated host response to infection . The host response to an infection consists of an exert inflammatory storm and concurrent immunosuppression, characterized by overwhelming promotive tissue damage, down-regulation of activating cell-surface molecules, T cell exhaustion and increased apoptosis of immune cells . These immunodisturbances cause a profound dysfunction in innate/adaptive immune responses  and seem to play a vital role in patient outcomes, particularly in older patients and those with preexisting immune dysfunction. Since only anti-inflammation therapies failed to save sepsis lives, an increased use of strategies designed to balance the immune system seems more reasonable. Polyclonal intravenous immunoglobulins (IVIG), which have pleiotropic effects on inflammatory and immune mechanisms, have been proposed as adjuvant therapy to modulate both pro- and anti-inflammatory processes . In 2016, SSC guidelines suggested against IVIG use in sepsis, which was based on weak evidence of efficacy from previous studies . However, results from recent trials and systematic meta-analyses indicate that intravenous IgM-enriched immunoglobulins (IVIgGM) may be effective in septic patients [8–10]. The present study therefore conducted a meta-analysis with trial sequential analysis (TSA) to evaluate the clinical effectiveness of IVIgGM in septic patients, with a view to helping guide clinicians in making treatment decisions. This meta-analysis was performed according to the Cochrane Handbook for Systematic Reviews of Interventions and presented based on Preferred Reporting Items for Systematic Reviews and Meta-analyses guidelines (PRISMA) . The review protocol was registered at the PROSPERO registry of systematic reviews in February 2018 (Registry Number: CRD42018084120). A systematic search of the PubMed, Cochrane Library, ISI Web of Knowledge, and Embase databases was conducted to update the 2013 edition of the Cochrane review  from inception to June 2018. Since its publication, 5 trials, including 3 randomized controlled trials (RCTs) [12–14] and 2 retrospective cohorts [8, 9], regarding the use of IVIgGM in sepsis have been published. The search strategy consisted of: (iviggma [All Fields] OR (igm [All Fields] AND enriched [All Fields]) OR (pentaglobulin [Supplementary Concept] OR pentaglobulin [All Fields] OR pentaglobin [All Fields])) AND (sepsis [MeSH Terms] OR sepsis [All Fields]). There were no language restrictions. 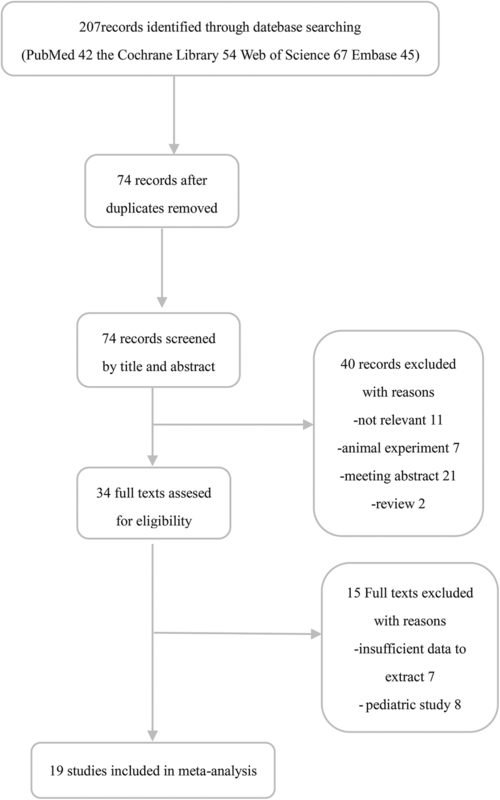 Additional studies were identified by reviewing the reference lists of relevant articles. Two reviewers independently evaluated studies to determine their eligibility for inclusion in the meta-analysis. In cases of disagreement, a consensus was reached by discussion or by consultation with a third reviewer. Trials were included if they: (1) compared IVIgGM with a placebo or another treatment group; (2) enrolled adult patients aged ≥ 18 years with sepsis; and (3) provided mortality data. Publications were excluded if they described irrelevant research or animal experiments. Also excluded were review articles, meeting abstracts, studies of pediatric patients, and studies with insufficient information (e.g., absence of mortality data), even after contacting the corresponding authors. Using standard forms, two reviewers independently extracted the data from each eligible study, including lead author, year of publication, study design, number of participating centers, sepsis severity, number of patients, mean ages of patients in the treatment and control groups, duration of treatment, daily dose of medication, type of control, baseline severity scores (e.g., Acute Physiology and Chronic Health Evaluation [APACHE] II Score; Sequential Organ Failure Assessment [SOFA]; and Sepsis Score) for the treated and control groups. Also follow-up period, number of deaths due to sepsis and the mean ± standard deviation or median length of mechanical ventilation and length of stay (LOS) in the intensive care unit (ICU) were recorded. If a meta-analysis mentioned that unpublished data were provided by the primary authors, these data were extracted from the forest plots of the meta-analysis and the original articles were reviewed to confirm whether those trials met the inclusion criteria of this meta-analysis. If these data were among the outcomes of interest, they were pooled with data from primary trials. Whenever possible, outcome data were separately extracted for each subgroup. The duration of treatment, daily dose, total dose, APACHE II or SOFA Score and publication year were recoded as “low” or “high” based on whether they fell below or above the median value of the entire set of studies. The primary outcome was all-cause mortality, including in-ICU mortality, 12-day mortality, 28-day mortality, 30-day mortality, 42-day mortality, and 70-day mortality. The secondary outcome was length of mechanical ventilation and LOS in an ICU. The methodological quality of randomized controlled trials (RCTs) was assessed by the Cochrane risk of bias tool . Each quality item was graded as low risk, high risk, or unclear risk. The seven items used to evaluate bias in each trial included the randomization sequence generation, allocation concealment, blinding of participants and personnel, blinding of outcome assessments, incomplete outcome data, selective reporting, and other biases. The overall risk of bias for each study was evaluated and rated as “low” when the risk of bias was low in all key domains; “unclear” when the risk of bias was low or unclear in all key domains; and “high” when the risk of bias was high in one or more key domains. The methodological quality of observational studies was assessed by the Newcastle–Ottawa scale, which consists of eight items evaluating the quality of observational studies, such as their selection, comparability, and outcome. Each study was given a Newcastle–Ottawa scale score of 0–9 (allocated as stars), with observational studies receiving ≥ 6 stars considered to be of high quality. Dichotomous data were expressed as risk ratio (RR) and continuous outcomes as weighted mean difference (WMD), both with their 95% confidence intervals (CI). Continuous variables were reported as mean (± SD) or median (interquartile range). To convert a median (interquartile range) to a mean (standard deviation), we used the formulas accepted in the literature . Chi-squared tests and the I2 statistic were used to measure statistical heterogeneity. A P value < 0.05 or I2 > 50% was considered indicative of substantial heterogeneity, leading to the application of a random effects model to estimate the summary RR, WMD and 95% CI; otherwise, a fixed effects model was applied. To evaluate whether the association between administration of IVIgGM and mortality was modified by clinical characteristics, subgroups were specified based on treatment duration (> 3 vs. ≤ 3 days), daily dose (> 0.25 vs. ≤ 0.25 g/kg), total dose (≥ 0.9 vs. < 0.9 g/kg), type of control intervention (placebo vs. human albumin solution), sepsis severity (sepsis vs. severe sepsis or septic shock), severity score(low APACHE II or SOFA Score vs. high APACHE II or SOFA Score), follow-up duration in the ICU (> 28 vs. ≤ 28 days),study design (RCT vs. cohort study) and year of publication (before 2005 vs. 2005 onward). Analysis was performed to assess whether the difference between the subgroups was statistically significant. Meta-regression analysis (MRA) was performed to explore the potential effects of heterogeneity and confounders on outcomes. Factors considered variables included year of publication, number of participating centers, number of patients, mean age, duration of treatment, daily dose, total dose, mortality rates of the IVIgGM and mortality rates of control groups. 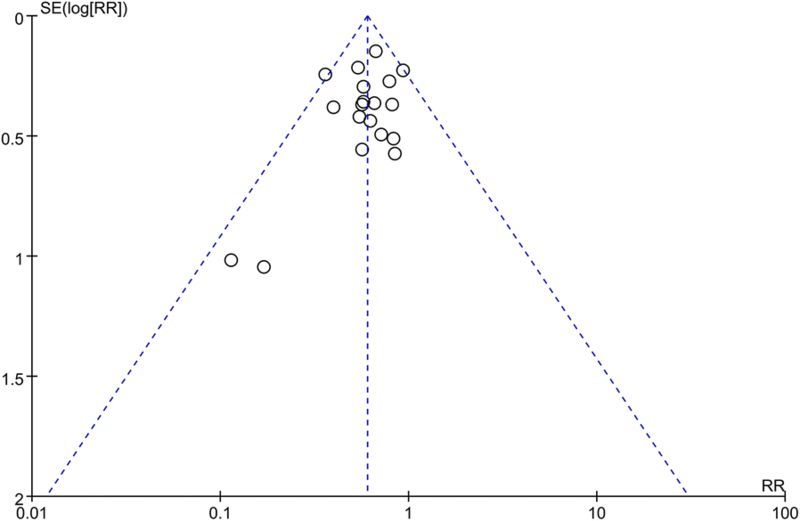 Publication bias was assessed by examining funnel plots when ≥ 10 trials reported the primary outcomes. All meta-analyses were performed using RevMan version 5.3 (Cochrane Collaboration) and Stata version 14.0 (Stata Corporation, College Station, Tex). All tests were 2-tailed, and P < 0.05 was considered statistically significant. Two investigators independently assessed the quality of evidence for outcomes using the Grading of Recommendations Assessment, Development, and Evaluation (GRADE). Each outcome was classified as having evidence of high, moderate, low, or very low quality based on risk of bias, inconsistency, indirectness, imprecision, and publication bias. GRADE Pro-version 3.6 software was used for these analyses. TSA was used to evaluate the cumulative effect of randomized trials on mortality. In this procedure, Z-curves were constructed for the primary outcome, and an alpha value at a conventional threshold was used to determine significance. 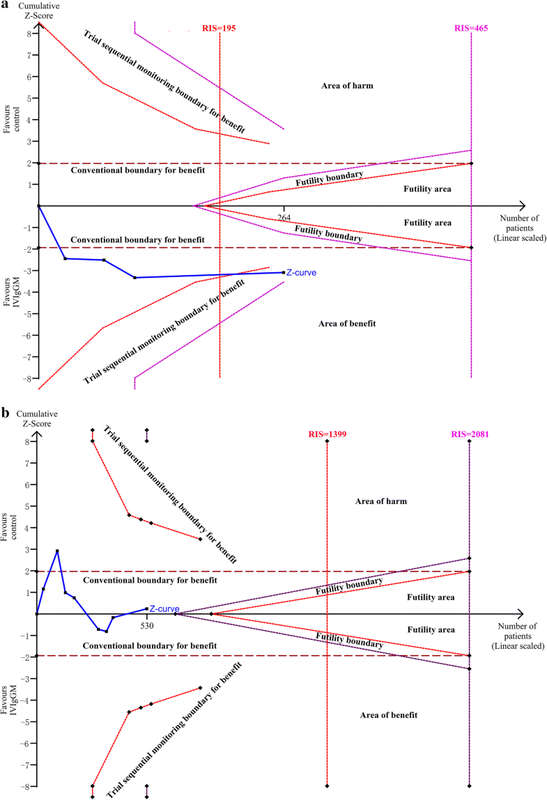 Adjusted significance trial sequential monitoring boundaries were constructed using the O’Brien-Fleming alpha spending method, with the assumption that significance testing may have been performed each time a new trial was sequentially added to the meta-analysis. For the TSA, the required information size was calculated based on a relative risk reduction of 20% in outcomes. The type I error (α) was set at 0.05 or 0.01, and the power (1 − β) at 0.80. The control event rates were calculated from the control group. TSA was performed using TSA version 0.9 beta software (http://www.ctu.dk/tsa) . The flow chart of the study selection procedure is shown in Fig. 1. The initial search identified 41 studies in PubMed, 54 in the Cochrane Library, 67 in the ISI Web of Knowledge, and 45 in Embase. After removing 133 duplicates, the titles and abstracts of the remaining 74 studies were screened. Forty studies were eliminated after reading their titles and abstracts, and 34 articles were scrutinized by reading their full texts. Seven articles were excluded because of insufficient data and seven were excluded because their study population consisted of children. Ultimately, 19 studies [8, 9, 12–14, 18–31] fulfilled our eligibility criteria and were included in the final meta-analyses. Characteristics of the included studies are shown in Table 1. The 18 studies included 15 RCTs [12–14, 16, 20–30] and four observational studies [8, 9, 19, 31], with a total of 1530 patients, and were published from 1986 to 2018. Fourteen studies (21%) were single-center and five (79%) were multi-center. The number of patients per study varied from 29 to 206. Mean age of patients in 15 of the included studies varied between 42 and 71.7 years, whereas mean age was not reported for four studies [21, 23, 24, 29]. Dosing regimens varied widely, with duration of treatment ranging from 1.5 to 5 days; one study did not report treatment duration , whereas 13 (68.4%) reported that patients were treated for 3 days. Average daily dose ranged from 0.15 to 0.35 g/kg/day, although two studies did not report this parameter [14, 19, 27]. Human albumin solution (HAS) was used as a control intervention in five studies, whereas no treatment was provided for the control arm in 14 studies. Follow-up periods varied, including follow-up in the ICU and after 12, 28, 30, 42 and 70 days. Additional file 1: Table S1 details the primary and secondary outcomes of the studies included in the meta-analysis. Additional file 2: Table S2 shows the quality assessment of the RCTs. Four had a high risk of bias because of undefined random methods. Five studies had a moderate risk of bias because participants and personnel were not blinded. The remaining study had a low risk of bias. Additional file 3: Table S3 shows the quality assessment of the four observational studies. Three studies each had scores of nine points, and the fourth had a score of eight points. Pooled estimates indicated that mortality rates were significantly lower in patients who received IVIgGM than in their respective control groups (relative risk [RR] 0.60; 95% confidence interval [CI] 0.52–0.69) (Fig. 2). Statistical homogeneity was met (I2 = 0%), and a fixed effects model was used to estimate the summary RR, and 95% CI. TSA results showed that the cumulative Z-curve crossed the conventional boundary and the trial sequential monitoring boundary (Fig. 3). These results indicate that this evidence is sufficient and conclusive, and that further trials are not required. Separate meta-analyses performed for sepsis and severe sepsis or septic shock subgroups showed similar significant effects (sepsis: RR = 0.60[0.46, 0.80], I2 = 0; severe sepsis or septic shock: RR = 0.60 [0.51, 0.71], I2 = 36) (Additional file 4: Figure S1). Likewise, Subgroup analyses based on severity score. In low APACHE II or SOFA subgroup, the pooled RR was 0.65 (95% CI 0.53–0.80; I2 = 0). In high APACHE II or SOFA subgroup, the pooled RR was 0.46(95% CI 0.34–0.63; I2 = 20) (Additional file 5: Figure S2). Additionally, subgroup analyses based on type of control intervention were performed. Compared with placebo, the pooled RR for IVIgGM was 0.57 (95% CI 0.48–0.67; I2 = 0). However, compared with HAS, the pooled RR was 0.74 (95% CI 0.54–1.01; I2 = 0). Other analyses showed that the results were generally consistent, regardless of duration of treatment, daily dose, total dose, follow-up duration, study design and year of publication (Table 2). A meta-regression analysis indicated that no variables significantly altered effect size (Fig. 4), whereas a trend toward a greater and more consistent decrease in mortality was seen among studies involving older patients. The length of mechanical ventilation was significantly shorter in IVIgGM group than in the control group, with a mean difference of − 3.16 days (95% CI − 5.71 to − 0.61 days; I2 = 33%) (Fig. 5a). TSA showed that the cumulative Z-curves crossed both the conventional boundary and the trial sequential monitoring boundary. Thus, further trials were unlikely to change the conclusion (Fig. 6a). However, pooled analysis demonstrated no significant differences in the ICU LOS between the two groups, with a mean standard difference of 0.38 days (95% CI − 3.55 to 2.80 days; I2 = 72%) (Fig. 5b). 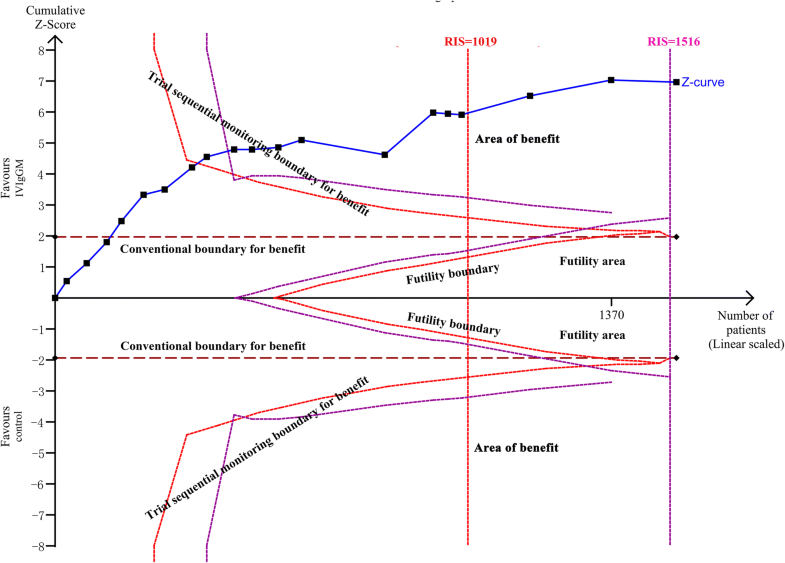 TSA analysis indicated the cumulative Z-curve did not cross the conventional boundary for benefits and did not enter the futility boundary. A TSA sensitivity analysis that included all trials indicated that the diversity-adjusted required information size was 1399 (Fig. 6b). Assessment of potential publication bias for the primary outcome (all-cause mortality) showed no bias among the included trials, as indicated by the presence of all results within the funnel (Fig. 7). The GRADE level of evidence for survival benefits from IVIgGM and length of mechanical ventilation was low and the level of evidence for ICU LOS was very low (Table 3). The present meta-analysis, which included 15 RCTs, involving 712 patients, and four cohort studies, involving 818 patients, assessed the use of IVIgGM preparations in adults with sepsis. IVIgGM administration significantly reduced mortality rates, with an RR of 0.60 (95% CI 0.52–0.69). Subgroup analysis showed that these results were generally consistent, regardless of duration of treatment, daily dose, total dose, variety of disease severity scores, follow-up duration, study design and year of publication. However, use of IVIgGM shortens mechanical ventilation days but not ICU LOS. This systematic review and meta-analysis have a number of methodological strengths. The research question was focused to include a specific clinically relevant population and a specific intervention. First, the protocol of this study was registered on PROSPERO. A registered protocol may increase the transparency and quality of meta-analyses. Second, the present study took account of disease severity grades for subgroup analysis and included length of mechanical ventilation and ICU LOS as an outcome. Third, TSA was used to assess the risk of random errors (spurious findings), with results supporting the contention that a 20% relative increase or decrease in all-cause mortality can be confidently excluded. Finally, we provided the evidence body level using the GRADE approach, which classifies the conclusions of studies as having high, moderate, low, or very low quality of evidence. Several recent systematic reviews and/or meta-analyses have evaluated the effects of IVIG on outcomes in patients with sepsis [10, 32–37], but these analyses have yielded conflicting results. Several previous meta-analyses found that treatment with IVIgGM more consistently reduced mortality than treatment with standard polyclonal IgG . Because of the limited number of articles, meta-analyses focused on a single type of IVIG (IVIgGM) had been not conducted. A recent review  summarizing current data on the established clinical uses of IVIgGM in patients with sepsis did not statistically pool available data to analyze whether IVIgGM treatment was associated with patient mortality. The results of this systematic review and meta-analysis indicate that, although IVIgGM did not shorten ICU LOS, it significantly reduced patient mortality rates and shorten ventilation days. In addition, our TSA of the primary outcome provided conclusive evidence that further trials were not required. Because many of these studies included mixed patient cohorts and patients at high risk, GRADE deemed the certainty of the body of evidence as low for both benefits and IVIgGM. Based on these findings, our center will be cautious in treating sepsis patients with IVIgGM as adjuvant therapy. The choice of the control intervention had a potential impact on the overall treatment effect. In contrast to one meta-analysis  and in accordance with another , a subgroup analysis based on type of control arm found that IVIgGM did not significantly reduce mortality rates when compared with HAS, but did significantly reduce mortality rates when compared with no treatment. Moreover, the effect of IVIgGM tended to be smaller and less consistent when compared with HAS than when compared with no treatment, suggesting that HAS may have had a biological effect. HAS has oncotic, carrier, antioxidant and anti-inflammatory properties and has been associated with a significant reduction in mortality rates in patients with septic shock . Alternatively, the use of HAS may be an indicator of more appropriate blinding, thus being associated with an overall higher study quality and lower risk of bias. A meta-analysis  has shown that different dosing regimens and durations of treatment appeared to affect the mortality rates. 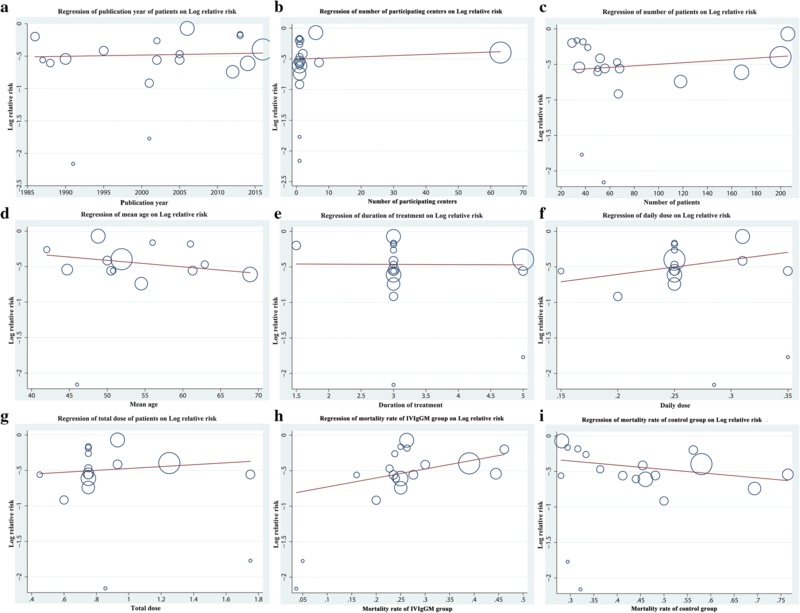 Our meta-regression analysis revealed that lower daily and total doses of IVIgGM tended to be associated with greater and more consistent reductions in mortality rate, although these differences were not statistically significant. As previously described , it is difficult to identify a clinical rationale for these associations. Thus, these results should be interpreted with caution, especially because of the high variability in study characteristics and patients differing in the severity of sepsis. Timing of IVIg administration is controversial. A recent study investigated the protective association between endogenous IVIg level and sepsis mortality . They found there is a risky level of immunoglobulins attribute to mortality in moderate (SOFA < 8) but not severe sepsis(SOFA ≥ 8), which drove researchers concerning much about IVIg substitution is worthy in different populations. Our subgroup analysis reveals that IVIgGM is beneficial for sepsis regardless of the disease severity (higher SOFA score, shock, or not). Although we deem believe more evidence should be added in, the present results conveyed a certain of confidence for clinicians to treat sepsis patients. For secondary outcomes, as the heterogeneity of available data, this meta-analysis did not find a significant reduction of ICU LOS after IVIgGM administration. ICU stay is a heterogeneous variable per se. Numerous social factors complicated with medical resources control influent the length of ICU stay . More reliable parameters like ventilation duration or free of ventilation days (VFDs) should be considered in clinical trials. With the available data extracted from literatures, ventilations days are significantly reduced in IVIgGM group patients, however, IVIgGM use did not increase VFDs (Additional file 6: Figure S3). Further research should evaluate this respiratory benefit. This systematic review had several limitations. First, study characteristics varied widely, including in duration and dose of IVIgGM and control interventions. However, our meta-analysis verified that IVIgGM treatment of adult patients with sepsis has a consistent rationale and was associated with a reduction in the relative risk of mortality, with low heterogeneity (I2 = 0). Second, the number of observational studies was relatively small, and there were few latest RCTs, indicating a need for large, multi-centered RCTs to support the present results. This study included data from the last 30 years. There have been many improvements in intensive care over the last half-century, including wider ranges of patients, as determined by both age and comorbidities, now treated within a critical care environment, suggesting a possibility of bias. Although the inclusion criteria for studies may not have changed, the populations in these studies have altered. Many patients not considered appropriate for critical care in the 1980s and 1990s now constitute the majority of patients in many critical care units in developed countries. Our exploration of subgroup hypotheses, including the era in which the studies were conducted, and the failure to identify any effect modification. Furthermore, the latest CIGMA study (Welte et al. 2018)  is strongly consistent with the final results, which markedly diminishes this concern. Fourth, all included studies enrolled patients based on previous diagnostic criteria for sepsis, as patients diagnosed by Sepsis-3 is more severe than Sepsis-2. Although the subgroup analysis is consistent with overall effect (sepsis vs severe sepsis or septic shock), we suspect that using the new Sepsis-3 criteria could change the efficacy of IVIgGM. Fifth, the reduction in mortality rate associated with IVIgGM was greater in studies performed among populations with higher baseline risk. Many patient-related factors may influence the clinical effect of IVIgGM therapy, such as an underlying state of immunosuppression, basal levels of endogenous Ig, time from sepsis diagnosis and IVIgGM administration or concurrent treatments [41–43]. Finally, it was not possible to analyze IVIgGM-related adverse effects, as these were reported by few of the included studies included. The use of IVIgGM, especially sucrose-stabilized IVIG preparations, has been associated with the onset of acute renal failure due to osmotic nephrosis in the proximal tubules [44, 45]. A specific review is required to clarify this point. The administration of IVIgGM to adult septic patients may have a rationale and may be associated with reduced mortality rates. Because current evidence is insufficient and too low quality to support the widespread use of IVIgGM as adjunctive therapy for sepsis, large-scale high-quality RCTs, using recently published Sepsis 3 definitions, are warranted to assess the benefits and potential uses of IVIgGM in the treatment of sepsis syndrome. Jie Cui, Xuxia Wei and Haijin Lv are co-first authors. Study concept and design were done by GLL and ZC. GLL, XXW, and JC acquired the data. Analysis and interpretation of data were performed by GLL, ZC, XXW, and JC. GLL and YTL drafted the manuscript. Critical revision of the manuscript for important intellectual content was performed by HJL, GLL, and PL. GLL and PL carried out statistical analysis. Administrative, technical, and material support was done by HJL, GLL, and JC. Study was supervised by HJL and GLL. All authors have read and approved the manuscript for publication. 13613_2019_501_MOESM1_ESM.docx Additional file 1: Table S1. Primary and secondary outcomes of the studies included in the meta-analysis. 13613_2019_501_MOESM2_ESM.docx Additional file 2: Table S2. Quality Assessment for Randomized Controlled Trials. 13613_2019_501_MOESM3_ESM.docx Additional file 3: Table S3. Quality Assessment With Newcastle–Ottawa Scale for cohort study. 13613_2019_501_MOESM4_ESM.tif Additional file 4: Figure S1. Subgroup analysis-sepsis vs severe sepsis or septic shock, evaluating survival benefit of intravenous IgM-enriched immunoglobulin (IVIgGM). 13613_2019_501_MOESM5_ESM.tif Additional file 5: Figure S2. Subgroup analysis-severity scores, evaluating survival benefit of intravenous IgM-enriched immunoglobulin (IVIgGM). 13613_2019_501_MOESM6_ESM.tif Additional file 6: Figure S3. Forest plot for ventilation free days (VFDs) after intravenous IgM-enriched immunoglobulin (IVIgGM). Thorlund K EJ, Wetterslev J, Brok J, Imberger G, Gluud C. User manual for trial sequential analysis (TSA). In Copenhagen Trial Unit, Centre for Clinical Intervention Research, Copenhagen, Denmark; 2011: p. 1 –115. www.ctu.dk/tsa.